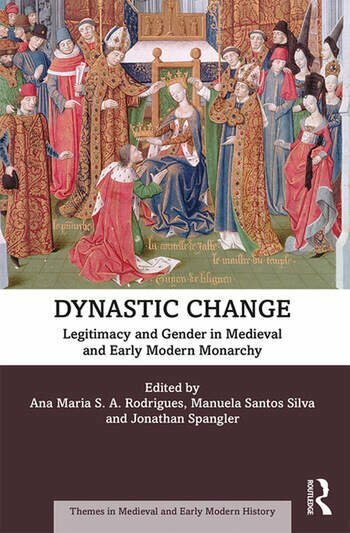 Dynastic Change: Legitimacy and Gender in Medieval and Early Modern Monarchy examines the strategies for change and legitimacy in monarchies in the medieval and early modern eras. Taking a broadly comparative approach, Dynastic Change explores the mechanisms employed as well as theoretical and practical approaches to monarchical legitimisation. The book answers the question of how monarchical families reacted, adjusted or strategised when faced with dynastic crises of various kinds, such as a lack of a male heir or unfitness of a reigning monarch for rule, through the consideration of such themes as the role of royal women, the uses of the arts for representational and propaganda purposes and the impact of religion or popular will. Broad in both chronological and geographical scope, chapters discuss examples from the 9th to the 18th centuries across such places as Morocco, Byzantium, Portugal, Russia and Western Europe, showing readers how cultural, religious and political differences across countries and time periods affected dynastic relations. Bringing together gender, monarchy and dynasticism, the book highlights parallels across time and place, encouraging a new approach to monarchy studies. It is the perfect collection for students and researchers of medieval and early modern monarchy and gender. 2 Portugal, 1385: A People’s Choice or Coup d’état? Ana Maria S. A. Rodrigues is a specialist in Medieval Queenship. She has recently edited, with M. Santos Silva and A. Leal de Faria, four volumes on the marriages of the Portuguese Royal House (Casamentos da Família Real Portuguesa, Lisboa, Círculo de Leitores, 2017-2018). She is Associate Professor at the University of Lisbon. Manuela Santos Silva is Adjunct-Professor at the University of Lisbon and specialist in Western Medieval Monarchy and Gender. She has recently edited, with Ana Maria S. A. Rodrigues and A. Leal de Faria, four volumes on the marriages of the Portuguese Royal House and before that, with Ana Maria S. A. Rodrigues and? Isabel dos Guimarães Sá,18 volumes on the Queens of Portugal. Jonathan W. Spangler is a specialist in the history of monarchy, particularly of France. His previous monographs include The Society of Princes (2009), and he is currently completing a survey of the lives of second sons in the French monarchy. He is Senior Lecturer in Early Modern History at Manchester Metropolitan University, and Senior Editor of The Court Historian.